This project is the perfect way to showcase your Spiro skills on your ear lobes! We love how these small rivolis look hanging from a set of ears. 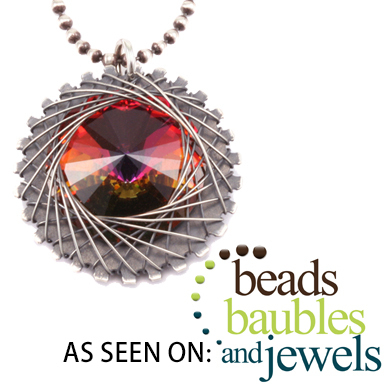 They look great short (hanging directly from a pair of ear wires) or longer (dangling from some chain). Make a pair to add some sparkle to to your life, or make a pair to complete a set to wear with your matching Spiro necklace! Nylon Jaw Plier - $15.05 - These are great to straighten out wire. Six Stepped Round Nose Plier - $18.05 - These are great for making your own ear wires. Sterling Silver Drawn Cable Chain 3.5mm x 2.5mm, by the Inch - $1.06 - x 2 inches. 20g Sterling Silver, Round, Dead Soft Wire -1/2 oz (~9.5 ft) - $21.07 - We used this gauge wire to create the ear wires. 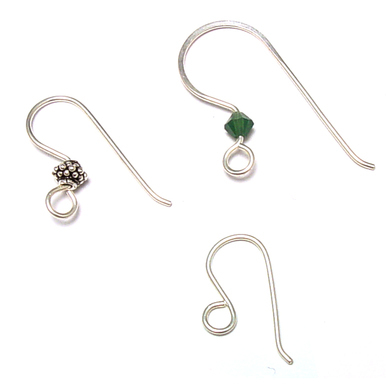 Sterling Silver Balled Earwires - $1.99 - These are a great alternative to making your own ear wires.